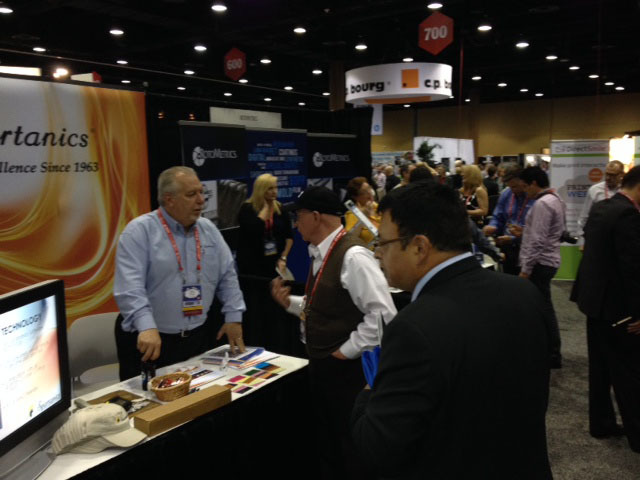 ROLLING MEADOWS, IL, USA – March 12, 2014 – Laser cutting solution experts, Spartanics, joined some of the leading industry print providers exhibiting at the Dscoop9 Break the Mold Conference in Orlando, Florida over the weekend. Dscoop9 reportedly had over 2,000 print professionals from 33 countries in attendance; reaching a 25% attendee increase from the year prior. During the Dcoop9 conference, Spartanics was able to meet with dozens of current and new customers that were in attendance. In addition to all of the educational opportunities provided by Dscoop, attendees also benefited from the in depth knowledge regarding laser cutting machines and other alternative cutting solutions at the Spartanics booth. “Dscoop continues to be a great opportunity for Spartanics to introduce new laser technology to the label market while cementing relationships with customers in the plastic card identification market, which is a market that we have a long history of cooperation with HP,” says Mike Bacon, VP of Sales and Marketing at Spartanics. Spartanics introduced one of their latest laser cutting technological advancements to Dscoop9 attendees; FastLine Laser Cutting Software. The FastLine Laser Cutting Product is a software program for the Spartanics L-350 Laser Cutting Machine that optimizes the pre-press process with a simple one click process that extracts die lines from print and laser files. This new laser cutting software is MAC and PC ready and is compatible with all Spartanics Laser Cutting Systems.